OSWEGO, NY – The winter sports season has been quite exciting thus far with success in the pool, on the ice, the bowling lanes and on the courts and mats. The Buccaneer swimming and diving team was able to keep its three meet win streak going against Syracuse at Nottingham High School. The boys were able to do this by turning in the top time in ten of the twelve events and win 97-79. Seniors Drake Becksted and Reeve Callen, along with freshman Dylan Harrington, were double winners. Becksted took first in the 200 I.M. with a time of 2:03.94, which is currently the top time in Section III. Callen placed first in the 50 free with a season best time of 23.07, placing him fourth in the section. He also won the 100 back with a best time of 57.58, the third fastest time in the section. Harrington put up the fastest time in both the 500 freestyle (5:56.85) and the 100 breaststroke (1:19.27). Senior Zach Gerber also had a good meet, winning the 100 fly in his best time (57.64) and placing second to Callen in the 50 free with a time of 23.67. Josh Gillard finished with 22 points to equal his number against CNS as the Bucs won their sixth of the year. The depth of the Buccaneers allowed them to put up the top time in all three relays. Junior Jeremy Galvin, sophomore Alex Kemper, and freshman Dylan Harrington and Ben McCrobie took the 200 medley relay in 2:03.25, out touching the competition by over nine seconds. Seniors Becksted, Callen, and Gerber, along with junior Jimmy Dylan, placed first in the 200 freestyle relay. Their time of 1:33.13 is a team best this season, and the second fastest time recorded in the Section so far this season. Completing their sweep of the relays were seniors Becksted, Callen, and Gerber, with junior Dillon, who put up the top time in the 400 freestyle relay (3:30.99). The Buccaneers will try to continue their winning streak against a traditionally strong Auburn team next week on Wednesday at home. The varsity basketball team never gave up in earning a hard fought 62-57 win over host Cicero-North Syracuse. 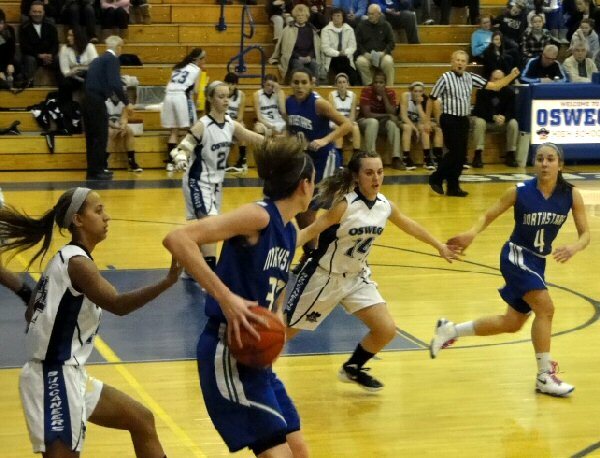 The Bucs trailed 27-20 after eight minutes, but outscored CNS 17-9 in the second quarter to go up 37-36 at halftime. Oswego built up a nine point lead midway through the third quarter for a 53-44 advantage, but CNS didn’t go away. The North Stars pulled to within four during the final quarter, but a strong defensive effort by Michael Thompson and clutch free throws by Ryan Lavner preserved the win. Josh Gillard finished with 22 points while Ryan Patrick had a dozen. Mike Thompson and Dylan Lavner had nine each while Kevin Carpentier and Ryan Lavner each scored five. “The boys fought hard tonight and are starting to buy into the defensive mentality that it takes to beat an elite team,” said head coach Bob Misch. The Bucs will host Nottingham on Tuesday, FM on Thursday and Hilton on Saturday. Tyler Grimshaw (20) had the winning goal against Auburn to provide win number eight on the year. 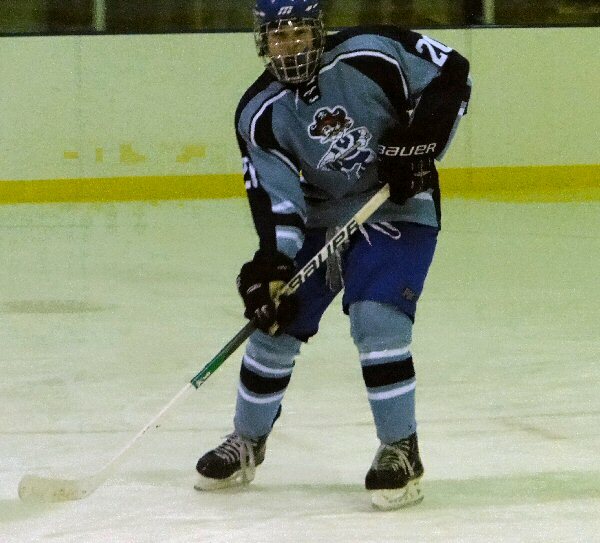 The Oswego High School boys’ hockey team moved into first place in Division II with a sweep of league foes. Oswego dominated Whitesboro at Crisafulli Rink for a 7-0 victory. Josh Cooley was forced to make just 14 saves while the Bucs were putting 33 shots on the Whitesboro net minder. The Bucs won it early with four in the first period and with Coach Andy Rozak keeping everyone fresh and rotating the line up OHS won handily. Cody Mariano had a four point night with three goals and an assist while Trend Yule (1-1), Dan Maniccia (1-1), along with Jeremy Purce (0-2), Tyler Grimshaw (0-2), John Phillips (1-0), and Dave Mathes (1-0) all contributed. The Auburn-Oswego match up was wide open with the Bucs winning 3-2 in overtime. Phillips and Mathes scored in the first period for a 2-0 lead, but with five minutes to go in the game Auburn had scratched back to knot the count at 2-2. Grimshaw scored a deflection 40 seconds into overtime on a shot by Yule to clinch the game and provide the eighth league win of the year against just one lose. Chase Izyk was in net for the Bucs and finished with 22 saves. Meanwhile, Auburn goalie Jeff Gardner stopped 29 Oswego shots. The Oswego boys’ bowling team won two of three in a hard fought, low scoring match against West Genesee while the girls’ captured three points against the Wildcats. 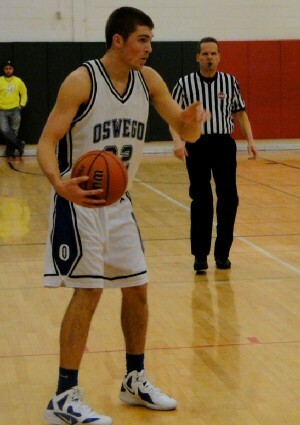 Oswego boys’ moved to 18-3 on the year with the girls improving to 12-9. The Bucs lost the first game 998-916, but came back with wins of 874-856 and 874-868. Joe Clavelli had a team high 591 (186-224-181) and was followed by Gavin Gilbert 551 (182-188-181), Matt Clemons 538 (178-189-171) and Zach Delbrocco 520 (178-161-181). Cameron Byrne bowled the first two games with a 192 and 153 while Jim Rose had a 160 in his lone game. Non-scoring players included Rose with a 562 (198-204-160), Dan Cliff 533 (176-183-174), Kevin Goodale 469 (154-136-179), Ethan Simmons 416 (156-125-135) and David Woolworth 321 (110-101-110). In girls’ bowling the Bucs won 691-555, 783-530 and 699-573. Sierra Adams had a 480 (169-162-149) and was followed by Ashley Lytle 466 (154-179-133) along with Caitlin Clemons 421 (137-138-146), Christie Hoefer 414 (119-151-144) and Rachel Nye 392 (112-153-127). Non-scoring bowlers included Abby Henderson 473 (130-154-189), Caroline Reynolds 369 (102-98-169), Meghan Flack 360 (105-129-126), Tori Gardner 330 (124-118-88) and Victoria Soper 288 (87-99-102). Oswego wrestlers walked off the mat with six individual victories while losing none in competitive action. However, the Bucs lost to Auburn 42-30 behind seven forfeit losses which accounted for all 42 points. At 99 Austin Coleman decisioned Jack Hogan 6-0 and at 126 Jordan Perchway pinned Pete Casper in 4:38. Oswego’s third win came at 132 as Matt DiFabio pinned Zach Proulx in 3:35. Miguel Vazquez, at 152, won over Nicholas Campagnola 2-0 and Mike Ruggio, at 182, pinned Bob Reynolds in just 27 seconds. Oswego’s 285 pounder Eric Doviak pinned Mike Carbonaro in 1:32. Oswego gave up six points for forfeits at 106, 120, 138, 160, 170,195 and 220. At the Ilion Tournament on Saturday the Bucs had some solid individual performances. At 99 pounds Austin Coleman won three of four matches. He started with a 2:56 pin of Christina Peters from Berne-Knox and then pinned Cole Rifanburg of Norwich in 3:59 before losing to Dandre Norman of RFA 11-0. He came back to win over Conner Steria of Lowville 5-3. Matt DiFabio, at 132, lost both of his matches. He was pinned in 22 seconds by Forest Boshart-Lowe of Whitesboro and then fell in 44 seconds to Travis Clarke of Copenhagen. Miguel Vazquez, at 145, started out being pinned in the first match by Bryan Bennett of Ilion in 1:54, but came back to pin Alex Lisandrelli of Mohawk in 2:24 and then pinned Jacob Mahoney of RFA in 18 seconds. He lost to Derek Struck of Berne Knox in 2:21 and then won his final match of the day scored a 13-4 major decision over Jon Marvin of Norwich. At 182 Mike Ruggio lost in the first match as he was pinned in 4:28 by Lymen Mecca of Lowville, but came back to pinned Zakk Zuranski of Mohawk in 1:33. Eric Doviak, at 285 started off with a 1:54 pin of Alexander Martin, but then Martin came back to pin Doviak in 2:15. He then lost to Jess Montasano of Berne Know in 27 seconds before closing out the day losing a 5-3 match up with Stephen Davis from Mohawk. Everyone talked about nationally regarded Breanna Stewart coming to Oswego, but it was quickly discovered that Cicero-North Syracuse is more than one player as the talent rich squad defeated the Lady Bucs on the court 65-21. Stewart put on a clinic in the first quarter as CNS jumped to a 21-4 lead and by intermission it was 42-9. For the Bucs Courtney Louis had seven, Emily Barlow five, Taylor Giglio four, McKenna Brooks and Erica Atkins two and Bella Winklestine one point. Stewart finished with 22 points while Abby Timpano had a dozen and Brittany Paul 11. On Jan. 5, the Bucs girls’ hockey team battled the defending state champ Little Red of Ithaca to a 4-0 loss at the Fort Ontario rink. The loss dropped Oswego to 0-3 in their division and 1-7 overall. Ithaca took a 1-0 lead at the 9:34 mark of the first period as Jackie Cornell scored on a partial breakaway, assisted by Krystalyn Yonkin. The Little Red made it 2-0 at 3:55 when the same two connected again, as Yonkin scored on a Cornell assist. Oswego’s Maddie Whalen recorded 20 saves in the period, as Ithaca’s Alex Stagliano was not forced to make any saves at her end. Oswego battled their way through the second period, allowing two more Ithaca goals at 11:19 and 5:35 (both by Shaina Joffe), but managed six shots on goal to Ithaca’s 18. The third period saw goalie changes by both teams, as Ithaca went with Devin Baylor and Oswego with Allie Yule. Play was fairly even throughout the period, as the Bucs continued to threaten deep in Ithaca’s zone. As the final period expired, however, neither team had scored; Baylor was credited with six saves while Yule recorded nine. Despite the loss, the Bucs showed determination and improvement. When the same two teams played in early December in Ithaca, the Little Red dominated all three periods in an 8-0 game, as Oswego played most of the game in its own end. This time around, the Bucs played with better execution in all three zones. Oswego’s next game is at division rival Alex Bay on Jan. 10. The last time the two teams met, the Purple Ghosts snuck out of town with a tight 2-1 decision, so the Bucs will be looking to even the series and earn a crucial division win. Senior standout Whitney Ford, turned in bests in the 300 meter dash and the triple jump, to lead the Oswego indoor track team, at the George Constantino Memorial Meet, held Friday at the SRC Arena, on the campus of Onondaga Community College. Ford leaped a personal best of 31′ 10 1/4″ in the triple jump, to finish fifth overall. Her fine season best of 45.36 in the 300 meter dash, earned her second place in her section of the race and six place overall, in a very competitive field. Freshmen Mariel Schickling, earned a best of 8.8l in the 55 meter dash, to finish second in her section and ran a personal best in the 300 meter dash, with a strong time of 51.72. Sparked by senior Dave Johnson’s personal best split in the 400 meter dash, Oswego’s 1600 meter relay of Alejandro Lara, Sean Benjamin, Roger Meirelles, and Johnson, ran a season of 4:05.5, to place finish fourth in their section. Chloe Patterson and Rhona Dianang turned in bests in the 400 meter dash and 800 meter run for the Bucs. Other bests included Marsaili Knapp in the 55 meter and 400 meter dash, Lexi Hanna, Krysta Broeker, and Kaylee Baldwin in the 400 meter dash, Ariel Bouffard in the 800 meter run, and Paul Oleyourrk in the 3200 meter run. The Bucs will return to action next Friday at the SRC Arena, for the Bob Grieve Memorial Meet, starting at 4:15 p.m.
Oswego Lady Bucs jayvee basketball lost a tough 47-29 game to CNS. Oswego came out strong staying in the game the first quarter. Oswego pressured CNS and forced turnovers. Both teams ended with five points at the end of the first quarter. CNS made some adjustments and pushed past Oswego taking over the second quarter scoring 19 points. Oswego came out in the third quarter with a burst of energy, but it was not enough to catch up. CNS outscored the Bucs in every quarter but the first. Leading scorers for Oswego (6-3) were Kerrigan Cummins with 6 points. Rachael Purtell with 6 points and 5 steals. Brenna Riley led the team with 5 rebounds.